Villa UJV 178, also known as Eugenia, has one bedroom, one bathroom and a pool. 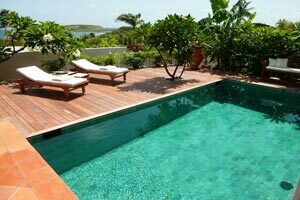 This villa is located in Grand Cul de Sac, St Barts, at the entrance of the Guanahani Hotel. UJV 178 offers a beautiful ocean view over Turtle island. This charming villa is nestled in a tropical garden. The villa is spacious and offers a large living room, which is elegantly decorated with art and antiques. At the back, the well-equipped kitchen opens onto an inside dining area and an interior patio, which is ideal for breakfast. The living room also opens onto the terrace, pool, and a large covered living and dining area. The master bedroom has a king size bed and ensuite bathroom. The terrace offers areas for relaxing, and a sundeck perched above the pool is perfect for sunbathing.